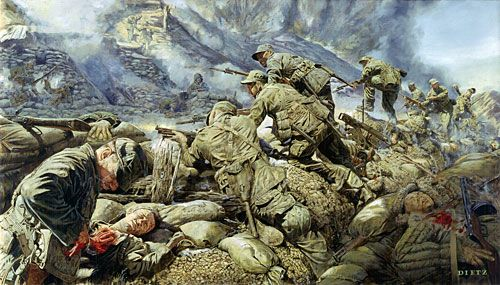 James Dietz Handsigned and Numbered Limited Edition Print:"At The Cutting Edge Of Battle"
About the Art: In the early morning hours of 25 June 1950, 90,000 North Korean Troops crossed the 38th parallel and began the invasion of South Korea. The Korean War had begun. The United States sent military assistance to the South Koreans and on 5 July 1950, the initial battle between Americans and North Koreans was fought. The North Koreans, often dressed in civilian garb, would infiltrate troops through American and South Korean line. These units would conduct raids and ambush operations in rear areas while the main force of the North Korean Army attacked in the front. In response to the North Korean tactics, the United States Army activated Ranger units to take the war to the enemy's rear area. The first Ranger unit formed was the 8th Army Ranger Company which was activated in theater on 24 August 1950. In the United States, the Army Chief of Staff, General Collins, initiated a program to establish a Ranger Training Center at Fort Benning, Georgia. A rugged course of instruction was established under the supervision of men who had served in Ranger and Special Operations units in World War II. The volunteer students of the Ranger Course would train and fight in Company size units. For the first time in Ranger history all those beginning the Ranger Course must be qualified parachutists. Ranger training was particularly arduous with a 5 mile run to begin the day. Day and night parachute operations were followed by 15 to 50 mile foot marches with full field gear. Demolitions, hand to hand combat, land navigation and infiltration techniques were followed by live fire exercises. Night training was emphasized. Those who completed this rugged course of instruction received a black and gold Ranger tab. This was the first time in history that this difficult to obtain and much sought after award was made. When the call went out for volunteers, 5,000 regular army paratroopers of the 82nd Airborne Division volunteered; 900 were selected and formed into the first eight Airborne Ranger Companies. As the war progressed, Infantry Divisions of the National Guard were activated. Volunteers from these divisions underwent Airborne training followed by Ranger Course. In total, 17 Airborne Ranger Companies were formed and served in the United States, Germany, Japan and Korea. The 1st, 2nd, 3rd, 4th, 5th and 9th Airborne Rangers were committed to combat in Korea, with the 1st Ranger company arriving in country on 17 December 1950. By early 1951 Rangers were fighting to the front of every American Army Division in Korea. They went into action by air, land and water. They made the first combat jump in Ranger history. Infiltrating enemy lines by foot and assault boat, they conducted raids and ambush operations and emplaced mines on enemy communications and supply routes. The Rangers spearheaded attacks, filled crucial gaps in defensive positions and were used in counterattack roles. One of every nine Rangers who fought in Korea died there. This print is dedicated to all American Rangers of the Korean War. Their sweat, blood and sacrifice from the training fields of Fort Benning, Georgia, to the battlefields of Korea demonstrated the eternal truth that freedom is not free.